Cardinal Blase Cupich, seen cradling a cross during a march against violence last year in Chicago, expressed "sorrow, disgust, outrage" last week in the wake of the Pennsylvania grand jury investigation, which implicated priests with connections to the Chicago Archdiocese. 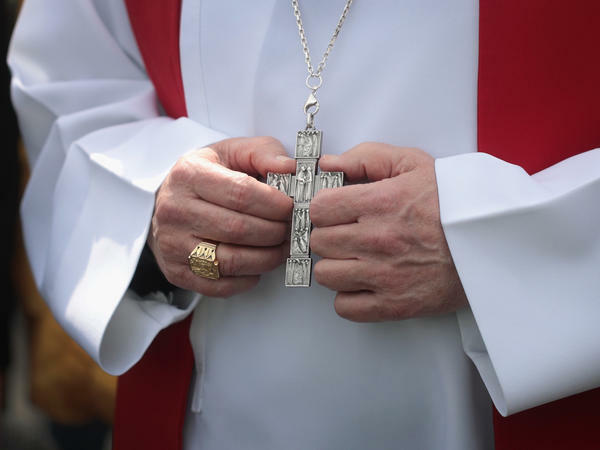 Nearly two weeks after the release of a Pennsylvania grand jury's investigation into clergy sexual abuse, the report's ramifications on the Roman Catholic Church are being felt far beyond state lines. Illinois Attorney General Lisa Madigan has announced that she will meet with the Archdiocese of Chicago and that she has contacted other dioceses in the state to discuss the Pennsylvania report, "which identifies at least seven priests with connections to Illinois." "The Catholic Church has a moral obligation to provide its parishioners and the public a complete and accurate accounting of all sexually inappropriate behavior involving priests in Illinois," Madigan said in a statement released Thursday. In a statement of its own, given to local media, the Chicago Archdiocese said it has "worked cooperatively" with county officials for years, and that it looks forward to "discussing our policies and procedures related to misconduct issues with [Madigan] and her office. Madigan said she expects the other dioceses to cooperate, but "if not," she warned, "I will work with states' attorneys and law enforcement throughout Illinois to investigate." The announcement came the same day that representatives of the St. Louis Archdiocese, some 300 miles away, told reporters that they would be handing over records to the Missouri attorney general's office. "We have nothing to hide," Archbishop Robert Carlson said at that news conference, promising Attorney General Josh Hawley "unfettered access" to its files. The 900-page grand jury report in Pennsylvania detailed decades of abuse and cover-ups in the state, saying investigators had found credible allegations by more than 1,000 victims — but noting they believe the real number could be "in the thousands." "But we are not satisfied by the few charges we can bring, which represent only a tiny percentage of all the child abusers we saw," the report stated. "We are sick over all the crimes that will go unpunished and uncompensated." The Pennsylvania report implicates 300 "predator priests" who allegedly committed acts of abuse in Illinois and a number of other states across the U.S. It says many of them received "treatment" from the church and were not reported to the authorities. In Minnesota, Jeff Anderson, a prominent advocate for clergy abuse victims, held a news conference Thursday calling on Gov. Mark Dayton to follow Pennsylvania's lead and convene the state's own grand jury investigation, as MPR News noted. Last week, in the wake of the Pennsylvania report's release, Cardinal Blase Cupich wrote a letter to the parishioners of the Archdiocese of Chicago to express his "anger, shock, grief, shame." "There is one other word that we bishops must summon: resolve. We must resolve to face our failures and hold each other accountable," Cupich wrote. "We must resolve to be clear-eyed about what we have done, what we have failed to do, and what remains to be done."